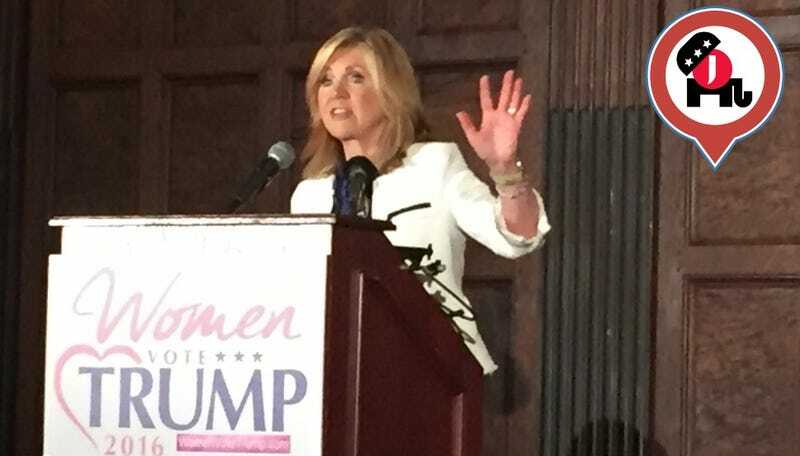 CLEVELAND — To find the Women Vote Trump, “the official home for women who support Donald Trump,” we went to a beautiful mall in downtown Cleveland, where about 30 Trump supporters and journalists met in a very large, lovely wood-paneled room and made the best of a slightly awkward situation. Kremer is a co-founder of Women Vote Trump, but is best known for having helped to found the Tea Party movement. Her voice echoed off empty rows of delicate white chairs on spindly gold legs. A lady in a red pantsuit applauded vigorously. “That’s right,” she nodded gently, as Kremer went on. Kremer was joined by Ann Stone, ex-wife of dirty tricks expert and noted racist Roger Stone, another co-founder of Women Vote Trump. “He has a track record with women that is amazing,” Stone told the room, specifically the way, she said, Trump treats women in business. “He has always paid women what they’re worth and paid them comparably.” The lady in the red pantsuit nodded, looking a little misty-eyed. Trump, Blackburn said, is the man to beat the terrorists back, and protect women in the process. She closed with a warning not to trust the mainstream media: “ABC is All About Clinton,” she said, to laughter. “NBC is Nothin’ But Clinton. CNN is the Clinton News Network. And CBS, God bless CBS, they’re the Clinton BS network.” That one brought the house down, or what there was of it. Women Vote Trump was careful to note that they’re a diverse movement. Stacey Dash, the newly vocal conservative actress, was supposed to be there, according to the program, but did not attend. An unnamed person from Latinas for Trump was supposed to attend, but also apparently couldn’t make it. But Diamond and Silk were there, two black women who are passionate Trump supporters.